Ok, so at first I was thinking about building a gun with a nozzle that opens before it shoots some sort of laser. Whilst looking for a solution for opening the nozzle, I found these really cool iris diaphragms. Then I got the idea to use two of them as "eyelids" and put some kind of controllable LED behind them. 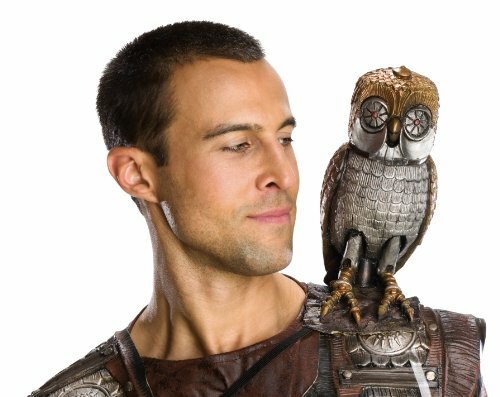 This reminded me of Bubo, the mechanical owl from "Clash of the Titans" So a new idea was born: build an owl with servo-controlled iris diaphragms for eyelids and glowing eyes. I have some extra servo's, so if there's enough space in the head, I could try to animate the beak also. As I'm not sure if the slip ring will allow me to use it for serial communication, I've got a pair of XBees for backup. I also found a text-to speach module that I'd like to incorporate, which should give it a nice mechanical, "robot-like" voice. Finally, I found some joysticks, which I could use for controlling the figure. So it looks like I have most of the stuff I need (I ordered the diaphragms immediately when I found them and they came in yesterday, the LED's should come in hopefully tomorrow) The only thing missing is the owl figure itself. I actually found a Bubo-prop, but if I'm not mistaken, it's made out of foam-latex, so I'm not going to be able to use it as-is. I ordered it anyway, because I'd like to try and 3D scan it, so I can make a 3D print. The nice thing about that would be that I'll be able to match the size of the eyes exactly to the size of the diaphragms. The only thing is, that my 3D printer is down at the moment. So I'm hoping to get it fixed in the next couple of days. 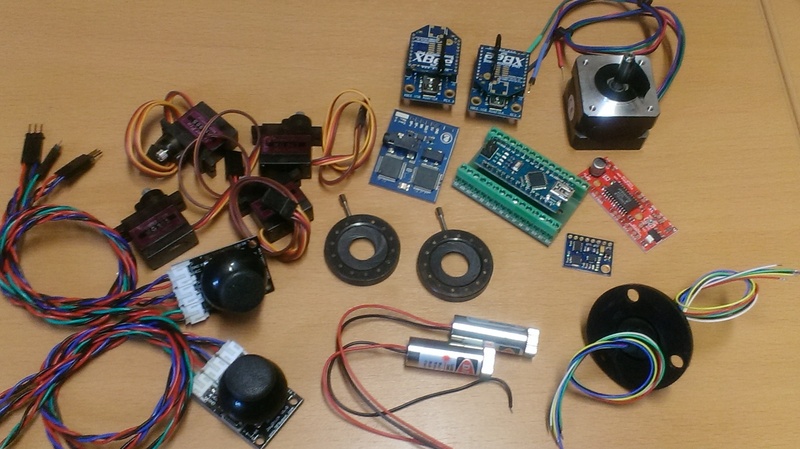 Other stuff like breadboards, hook-up wire, prototype boards, buttons etc. I should have plenty of. For now, I'm just going to use a bench power supply for power and a set of computer speakers for sound. Maybe later on, I'll exchange those with a battery and an internal speaker and amplifier. So that's the basic idea. I hope to be able to actually build it (no idea how much time we'll be allowed to put it all together). Otherwise, getting the electronics to work will be a nice challenge by itself. Did a quick design for a temporary mechanism. I'll try to get it printed and maybe actually get something working. Now back to programming! Electronics are working, although there's still some finetuning to do. The servo and neopixel functions are still creating some lag. I had to set the steppermotor to full steps to get it up to speed. Also, I havent't gotten the audio fragments to trigger randomly. I'd like to get all the functions working randomly and be able to have them overruled by live input, but that will probably have to wait. Mechanically, I have to do some adaptations to the gears I bought and I'll have to make some rollers, as the ones I printed didn't come out very nicely. I'll also have to come up with a way to connect the servo's to the diaphragms. So, we're getting there, but still enough to do. //written for neopixel jewel, which consits of a ring of 6 led's, with one led in the center. //when the value of the potentiometer increases, first the center pixel lights up, then the other 6 follow. //reads the value of a button. I've connected the servo's and the neopixels to the slipring, so the platform can now rotate continuously. The cabling has been tidied up a bit and everything seems to be working. I'm currently printing a new top plate, as the openings for the servo horns were a bit too narrow. Once that is finished, I can connect the servo's to the diaphragms and the mechanism will be finished. The code is working, but I'd still like to build some more randomness into it. That will probably have to wait untill monday. I got the steppermotor and the audio working both through manual input and randomly. I didn't have time to do the servo's too, so at the moment they can only be controlled manually. //spins a steppermotor when a button is pressed. Last update for this course. - diaphragms move to random positions, with random delays between movements. - LED's behind diaphragms light up simultaniously. 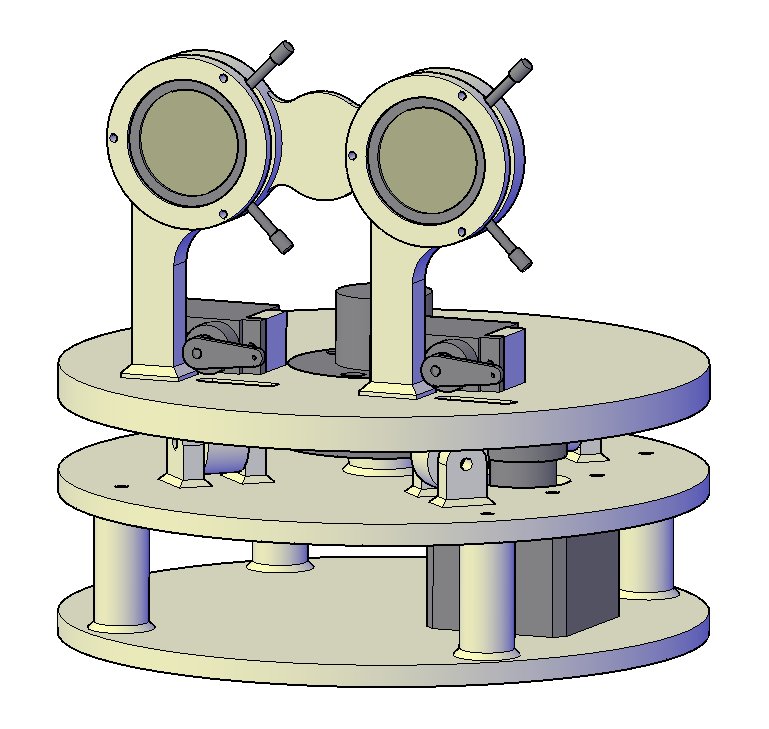 - platform rotates to random positions, with random delays between movements. - audiofragments are triggered randomly, with random delays between triggers. The mechanism uses two arduino's because the code for the audio is blocking. By using a seperate arduino for the audio, all functions can be run simultaniously. There's a slipring built into the platform, so it can turn without restrictions. timerDelayBetweenServoMovements = millis(); //starts "clock"
timerWaitBeforeRandom = millis(); //starts "clock"
timerDelayBetweenRotations = millis(); //starts "clock"
//when the value increases, first the center pixel lights up, then the other 6 follow. Looking great! Every time I watch your progress videos I get that song stuck in my head!